What is the first thing that comes to mind when you think of a traditional horse fence? Is it the classic wood post and rail board fence painted white or black, or a glossy vinyl fence that never needs painting? Does it conjure up thoughts of the dreaded time and money required to maintain the traditional wood or vinyl fence to keep it looking nice? Is it what is best for the safety and security of your horses? Whatever type of horse fencing is best for you and your horses will likely differ from what works for others. Is there such a thing as a perfect fence for horses? Wood has been the preferred choice for horse fencing for years primarily because the plank boards are readily available and create a boundary that is very visible to the horse. Wood board fence quickly became the traditional type of fencing for horses and remains tremendously appealing because it looks very nice, particularly on the rolling hills of the countryside. But wood requires regular painting or sealing, horses chew on wood, wood rails break, and the large splinters from broken rails can injure horses. PVC (polyvinyl chloride) became a popular option for horse fencing because it has a similar traditional look to wood board fences but does not require painting. However, PVC rails sag in the heat, collect mold in the shade and turn brittle and break in the cold. The shards from broken rails are sharp and can injure horses. The variety of colors available quickly fade, particularly black. There are many variations of the traditional board fence that continue to evolve, including vinyl coated wood planks, HDPE (high density polyethylene), and high-tensile coated wire encased in polymer bands resembling thin board planks. Each variation has its pros and cons. So what about steel for horse fencing? Steel after all is the most widely used metal in the world because it is strong, ductile and inexpensive. It is also one of the most recycled materials in the world because steel can be recycled to make new metal products of the same quality. It has applications in just about every imaginable industry and the horse fencing industry should be no exception. However, most of the metal fencing for horses is of the steel pipe style or steel wire, not the more popular, traditional board style. Not until now. 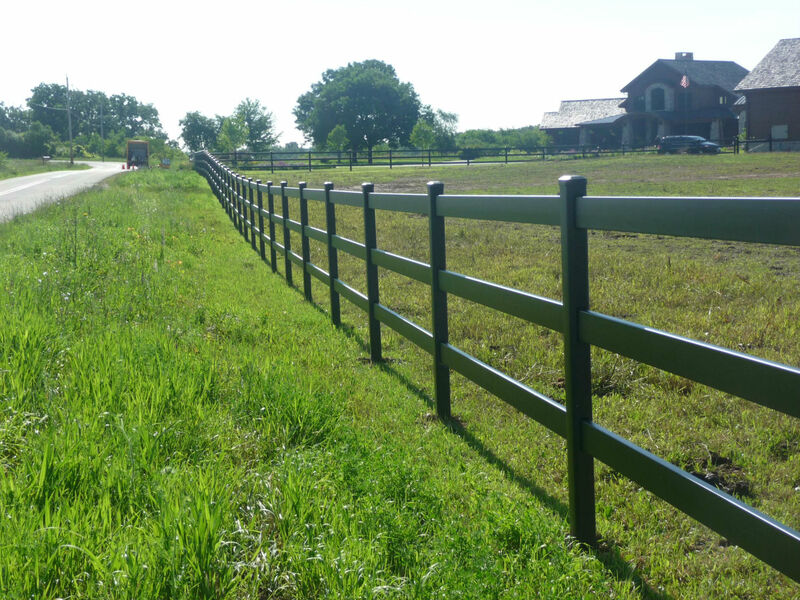 Buckley Fence offers a unique traditional looking board style horse fence made of steel appropriately named the Steel Board Fence. Owner and innovator Jim Buckley designed a way to form cold rolled steel into a geometry that is strong and light enough to be economical yet keeping within the parameters of roll forming. To protect the steel from corrosion, Buckley selected two-sided zinc galvanized steel. The internal weld seam created to complete the form is sprayed with zinc to enhance protection. The formed parts are cleansed and treated in a phosphate bath to give an added layer of protection with a phosphate conversion coating that enhances paint adhesion and corrosion resistance. The final coat applied at the factory is an architectural grade polyester powder coat. The end result is a “steel board fence” highly resistant to corrosion with exceptional paint adhesion, superior UV protection, significant strength, and good longevity. The Steel Board Fence rails are similar in dimension to wood board rails and have slightly rounded edges for safety. Cut to 10 foot lengths, the rails flex when impacted and will not break, warp, or splinter. The rectangular 3 ½” x 5 1/8” posts are pre-punched with rail openings lined with rubber grommets to protect the rails. Inside the posts are lock spacers that hold the rails in place and eliminate the need for nails or screws to secure the rails. The textured black finish is exquisite and will never fade or require painting. The Steel Board Fence system is patent pending. If the traditional board fence works best for you and your horses, take a look at the Steel Board Fence. It could possibly be the perfect horse fencing system. Visit www.buckleyfence.com for more information. Jim Buckley is an experienced, successful engineer whose career spans over 30 years in research and development. His expertise in metals and powder coatings led to the development of the Steel Board Fence system and the formation of Buckley Fence in 2007.